volunteers who serve as contributors for this series. We are constantly inspired by their courage to step outside of their comfort zones and their commitment to serving those most in need. They have remarkable stories to share, filled with light and hope. Each week, a different writer reflects on the Sunday Gospel reading through the lens of their volunteer experience. Their insights on the four pillars of faith-based service; Community, Social Justice, Spirituality, and Simple Living, call us back to the true meaning of Advent. 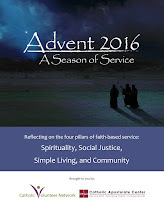 Click here to download the complete Advent 2016 Reflection Guide. In this gospel, John questions whether Jesus is truly the one that he and countless others had been waiting for. In many ways, what John has heard about Jesus does not quite match up with the kind of person he had expected Christ to be. I look back to my year of service and remember thinking similar thoughts while living among the poverty and great suffering that so many of our neighbors faced. I went to Ecuador in hope to always see the face of Christ in others and to do my utmost to be the face of Christ to all those I encountered. In many ways, I had started my year thinking that recognizing and encountering Christ meant finding joy and goodness, no matter how difficult the situation. However, as we journeyed through our year, my community and I experienced many situations when Jesus seemed unrecognizable and completely hidden. We came to know so much injustice, hurt, and suffering in the lives of our friends there that at points I, like John, also questioned who Jesus was. After some time passed, much prayer, and many discussions with my community, I came to understand that Christ was in fact looking at me, straight in the eye, each day. For the first time, I recognized that He was Jesus Christ on the cross. That Face of Christ that suffers with us, that knows pain and sorrow, but also that face that rises from the dead and brings us unimaginable hope of the kingdom of heaven and eternal life with Him. Living in community can be hard and so challenging at times (generally, most of the time!) Unfortunately, if we are struggling with our faith or other such things, we, unlike John, cannot simply send a member of our community out to go ask Jesus the big questions and return with answers. However, we must remember that by praying together and journeying with one another, Christ is in fact there guiding us along each step of the way. For, He told us, “Where two or three are gathered, there am I in their midst.” Living in community with an openness to be vulnerable, to lean into discomfort, and to pray together holds so much potential for encountering some of Christ’s purest love. Think about John the Baptist in this Gospel. He was in prison and unable to go out and find Jesus himself. Without the gift of his friends, he may not have been able to know if Jesus truly was the Christ. This week, let us recognize those in our community who don’t seem to have anyone to bring them Christ’s love and peace. Do your best to be like those friends of John and bring that person the good news of Christ. Whether that means visiting the sick or imprisoned or sitting down with a co-worker who is having a hard day, there are countless people who need the gift of a friend that can share with them the love of God. Help me to further humble myself and to give with a selfless heart. Grant me the openness to receive you into my heart in a new way this Christmas that truly transforms me. Guide me as I continue on my journey in community with others, grounded in love. Help me to recognize you in those that I serve, even when it is most difficult. Let me truly hear your words of healing and hope, and enable me to spread your message to those who need to hear it most. To learn more about Rostro de Cristo Volunteer Program, please click here.